Russian President Vladimir Putin arrived in Iran on the same day the Kremlin issued a formal decree easing an export ban on nuclear equipment and technology to Iran, following a deal reached in July between world powers and Iran on its nuclear program. According to the decree, Russian firms are now authorized to export hardware and to provide financial and technical advice to help Iran with three specific tasks. The tasks were identified as helping Iran modify two cascades at its Fordow uranium enrichment plant, supporting Iranian efforts to export enriched uranium in exchange for raw uranium supplies, and helping modernize its Arak heavy water reactor. The decision follows a landmark deal between six world powers and Tehran in July, under which Iran agreed long-term curbs on a nuclear program that the West has suspected was aimed at creating a nuclear bomb. The deal will lift international sanctions on Iran in exchange for at least a decade of curbs on the country's nuclear activity including reducing the number of centrifuges used to enrich uranium, and its enriched uranium stockpile. The agreement to ease Russia's nuclear export ban to Iran came as Putin paid an official visit to Tehran, meeting with Ayatollah Khamenei, the country's supreme leader. Putin and the ayatollah had planned to "discuss all topical issues of bilateral cooperation — trade and investment cooperation, nuclear energy, oil and gas production, military and technical cooperation," Russian presidential aide Yuri Ushakov said in a statement last week. This is Putin's first visit to Iran since 2007. 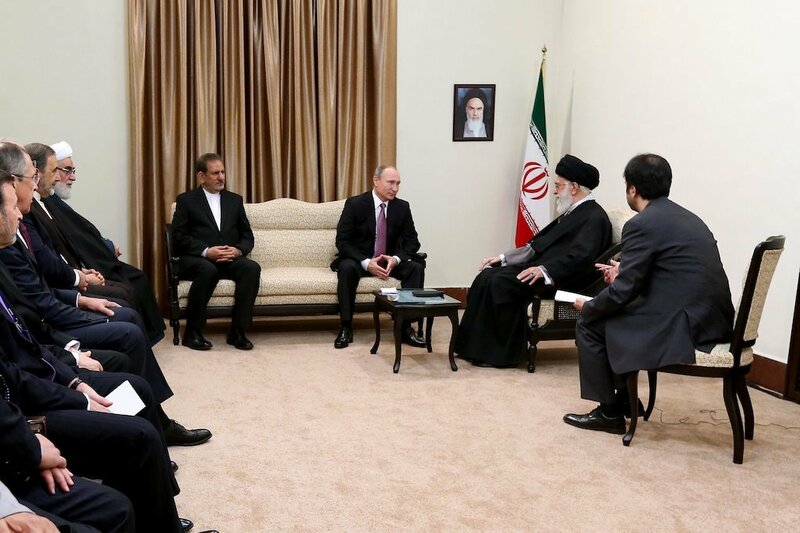 On Monday, Khamenei published pictures of the event on his website showing Putin speaking with him among a group of dignitaries. Putin, who will attend a summit of gas exporting countries on Monday in Tehran, is also expected to discuss the Syrian civil war and other issues with Iranian President Hassan Rouhani.